There are certain Southern snacks that are always crowd pleasers. As guests mingle with cocktails between the ceremony and dinner at the reception, consider offering up tasty bites inspired by local restaurants to entice guests. 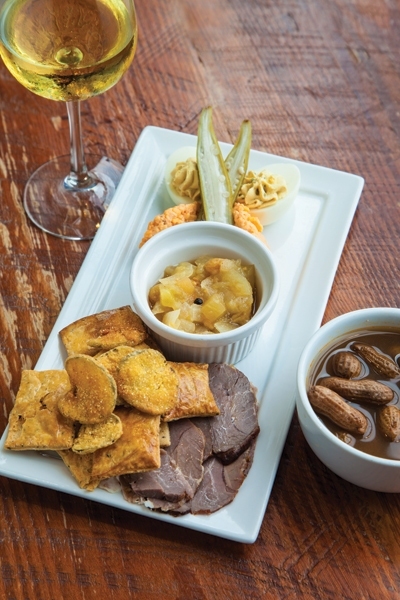 Purloo’s Southern Board is a great inspiration for appetizers. Each board is laden with pimento cheese, green tomato chutney, deviled eggs muniere, fried pickles and boiled peanuts. Crispy and gooey grilled cheese bites will keep guests happy as they sip and socialize. Use St. James Cheese Company’s version as inspiration: multigrain bread filled with gruyere and caramelized onions. Bites of spicy and smoky Andouille and boudin sausages will keep people coming back for more. See Emeril’s version for inspiration. Miniature chicken and waffles are the king of brunch. Morsels of this savory dish drizzled with local honey will keep guests happy until dinner. Try La Petite Grocery’s version for a quick lesson in perfection. If you are looking for a savory beignet, try Restaurant R’Evolution’s beer-battered crab beignets with remoulade as inspiration for mini bites. Or, bring out bite sized beignets covered in powdered sugar for dessert with mini cafe au laits to prep people for the after party, just like at Cafe du Monde.